I was thinking yesterday, after the announcement of #70922 The Joker Manor, that there's been a lot of D2C (Direct to Consumer - 'Exclusive') sets this year - the really large sets, with correspondingly large prices. I wondered how this compared with previous years, so I thought I'd have a bit of a look and find out. I therefore searched on Brickset for all sets tagged as 'D2C', and used that data to work a few things out. The following information is a summary of all years with D2C sets - 2000 to 2017. I've listed number of sets, total number of pieces, total UK RRP price, and the average Price Per Piece (PPP). I've also listed the total UK RRP price at 2016 prices - i.e. taking inflation into account, which I worked out using the Bank of England's UK inflation calculator. The prices for 2000 - 2004 aren't included because Brickset doesn't have complete information for those years, so it wouldn't have been a fair comparison. As you can see, the total piece count has gone up consistently over the years, although the number of sets has remained fairly constant over the last 4 years or so. The PPP has remained steady since 2010, and has even decreased when you take inflation into account (2016 PPP). I was mildly surprised, as it felt to me that there has been more D2C sets this year than in previous years, but obviously not! For completeness, this is the list of all D2C sets. It may have felt to you like there were more D2C sets this year because of the two large Ideas sets (Old Fishing Store and Saturn V), which are technically not D2C despite being on par with them price-wise. ^ Actually yes, that's why! As you can see, the total piece count has gone up consistently over the years, although the number of sets has remained fairly constant over the last 4 years or so. You see "fairly constant", I see "slow growth". Both are correct. It is. 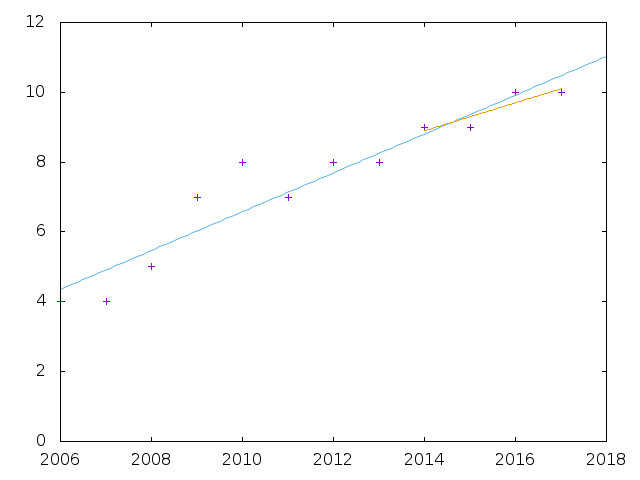 But then ..
Blue line fits (via linear regression) all data, yellow just the last four years. I see slow growth. Is there a Lego Store in Ireland? Perhaps the rule only applies to countries that have physical stores? D2Cs generally are sold by Lego first, exclusively, for a period of at least a few months. Other non-D2C sets are sold by other retailers at the same time as they're sold by Lego. Nope, no LEGO Stores here unfortunately. I was just about to start the same discussion but rather than talking about D2C because this term is getting a bit messy I was going to look at large sets by part number. I'd also agree with THIS statement for countries that have LEGO brand stores. There's also the fact that the peak price for normal retail sets in some themes has been rising. Destiny's Bounty and First Order Star Destroyer are not D2C sets, but cost $160 each. Previously the biggest non-D2C Ninjago sets were $120 and the biggest non-D2C Star Wars sets were $150. Arkham Asylum is $140, The Ultimate Batmobile is $140, and Flying Fox: Batmobile Airlift Attack is $130, while previous non-D2C Super Heroes sets peaked at $120. That said, the price increases in all of these themes besides the two that got LEGO movies this year have been fairly gradual, not abrupt. And in the case of Star Wars, these high price points seem to be somewhat justified, seeing as Episode 7's $150 Millennium Falcon was the second best selling set of 2015 and the best selling set of 2016. If The Last Jedi generates anywhere near as much demand as The Force Awakens did, LEGO is going to want to have sets out that can fulfill that demand. City and Friends haven't seen their peak retail prices rise in a couple years, and truthfully haven't even been hitting them with any of their new releases, but that's probably in part because their most expensive sets from two years ago (City Square, Heavy Haul Train, and Heartlake Grand Hotel) are all still available. Anyway, AFOLs might not care so much about these themes' prices as about the prices for more complex sets and themes that are closer to an adult building level.